The benefits of using accounting software for business are well known. When it comes to selecting the right product, though, the choices can be daunting, especially since switching from one accounting software package to another is not a trivial exercise in most cases. Examining your current and potential future needs can help you make the right decision. If you are just starting a business as a sole proprietor/contractor or a very small business owner without employees, you can probably get by with a basic online invoicing/billing package like Sage One or FreshBooks that can handle invoicing, expense tracking, and produce basic reports to keep tabs on your business and satisfy your accountant and the taxman. Accounts payable: money owing to vendors, suppliers, etc. Also typically included in the more expensive packages are features such as payroll, stock/inventory management, project management, financial forecasting, multi-user access, and a wider variety of reports and financial statements. If your present needs are basic but you are contemplating future business growth make sure whatever accounting package you choose has a path to expand to your future requirements. In many cases, if the core product is missing a feature, you can fulfill your needs with third-party add-ons to your existing software. There are hundreds of these available for most of the packages reviewed in this article, including payroll, customer relationship managment (CRM), analytics, and more. This article contains the most popular small business accounting software packages for Canadian small businesses, ranging from basic to advanced in features (and cost). Some are online-based (cloud) only, some are available in desktop or online versions, and some are hybrids of both. If you are looking for a basic, inexpensive, cloud-based accounting package Sage One fits the bill. Sage One is designed for entrepreneurs and small businesses that need basic income and expense tracking. It does not include features such as payroll, purchase orders, or time billing, and reporting is minimal. As well as browser access there is a mobile app for Apple and Android-based devices. The great thing about using an online app is that the software will always be up to date and you will never need to worry about your data being backed up. Visit the Sage One site for more information. FreshBooks is another inexpensive, online-only solution that does a very good job of invoicing and basic bookkeeping and is ideal for small businesses and independent contractors. It supports all the most commonly used web browsers and also has iPhone/iPad and Android apps. FreshBooks has a free 30-day trial period, after which you can select one of four monthly plans depending on how many users you need and how many clients you have. Getting started with the application is a snap — fill in a page of basic information about your business and you are off and running. The single-user version includes invoicing (including auto-billing and payment reminders), estimates, expense tracking, time tracking, and reports. It integrates with a number of common payment processors. The multiple-user versions come with basic project management, team timesheets, and team expense reporting. As with Sage One, calling FreshBooks an accounting package is a bit of a misnomer as it does not perform a number of true accounting functions such as accounts payable, payroll, or double-entry bookkeeping. It can be more accurately described as a robust invoicing/billing solution. FreshBooks consistently gets high marks from customers for ease of use and customer service. Visit the Freshbooks site for more information. Zoho Books is another subscription-based online accounting application that is very popular with small businesses. The invoicing, estimating, expense tracking, time tracking, and bill payment features make it ideal for freelancers. Unfortunately, at present it does not include payroll nor does it integrate with third party payroll apps or services. Zoho Books is supported on all major browsers as well as having apps for Android, iPhone-iPad, iPhone, iPad, and Windows Phone mobile devices. Zoho books integrates with Zoho CRM (Customer Relationship Management) as well as various 3rd party applications, including Google Apps for Work and PayPal. A free trial is available. Visit the Zoho Books site for current pricing information. QuickBooks has long been one of the dominant small business accounting programs, popular with users for its wealth of features and user-friendly interface. Intuit really knows its audience and caters to it. Both the desktop and online versions have a free 30-day trial. The desktop version is available in Pro, Premier, and Enterprise editions. The Premier version adds industry-specific tools and reports as well as forecasting and business planning tools. The Enterprise edition is designed for up to 30 users. As well as browser accessibility QuickBooks Online has iPhone/iPad and Android applications for mobile devices. The online "family" has multiple tiers, including EasyStart, Essentials, and Plus, each with very competitive pricing. All versions allow tracking of income and expenses, invoicing, and online linking to financial institutions. The Essentials versions allow access for up to 3 users, and the Plus version adds purchase order handling, inventory tracking, and access for up to 5 users. Payroll can be added for an additional cost. There are also a huge number of third party compatible add-ons for QuickBooks. It appears that Intuit may be slowing phasing out the desktop versions of QuickBooks and putting the focus on the online version. This is readily apparent on their website where the online version is predominantly featured. Fortunately, it is easy to migrate the desktop versions to the online version — simply choose the option to "Export to QuickBooks Online" within QuickBooks Desktop and follow the prompts. Visit the QuickBooks site for more information. Sage 50 Accounting used to be known as Simply Accounting, a tried and true comprehensive small business accounting solution. It does everything Canadian businesses need to do (including calculating and paying GST/HST and PST/QST and preparing government T4's, ROE's or RL-1's through print or efile) and is bilingual, letting you switch from French to English on the fly. Sage 50 First Step: (desktop) basic invoicing and expense tracking only — features similar to Sage One. Only sold at retailers (such as Staples and Best Buy). Sage 50 Pro: (desktop) accounting. Sage 50c Pro: (online) same features as Sage 50 Pro but adds also includes cloud storage, integrated credit/debit card payments and payroll. Sage 50 Premium: (desktop) same features as Sage 50 Pro but includes multiple currencies handling, time and billing, departmental accounting, and up to 4 users. Sage 50c Premium: (online) all the features of Sage 50c and Sage 50 Premium. Sage 50c Quantum: (online/desktop) all the features of Sage 50c Premium plus mobile task management and support for 5 or 10 users. As with QuickBooks, Sage appears to be steering customers towards the monthly payment-based cloud versions, which are in fact excellent value for money as payroll is included. Payroll is an expensive addition to the desktop versions. Visit the Sage 50 site for more info including pricing. In addition to browser support Xero has Android and iPhone/iPad apps for mobile devices. Xero has a free 30-day trial period. Note that Xero Pricing is in U.S. dollars. This is the accounting software that used to be MYOB Accounting Plus. AccountEdge is the Swiss army knife of small business accounting software, including inventory, banking, payment processing, payroll, document management, a wealth of reporting capability, and a high degree of user customizability. AccountEdge Pro is designed for businesses that need a comprehensive accounting system. AccountEdge Pro is desktop-based (Macs or PCs), with an add-on online application called AccountEdge Cloud that is designed to complement the desktop version. The online version allows employees to manage customer information, enter expenses, create orders, quotes and invoices, make payments, and process credit cards through a merchant account. At present, the online version syncs with the desktop version (and vice-versa) through Dropbox. There’s also a mobile app for iPhones and iPads called AccountEdge Mobile that performs the same tasks as AccountEdge Cloud. 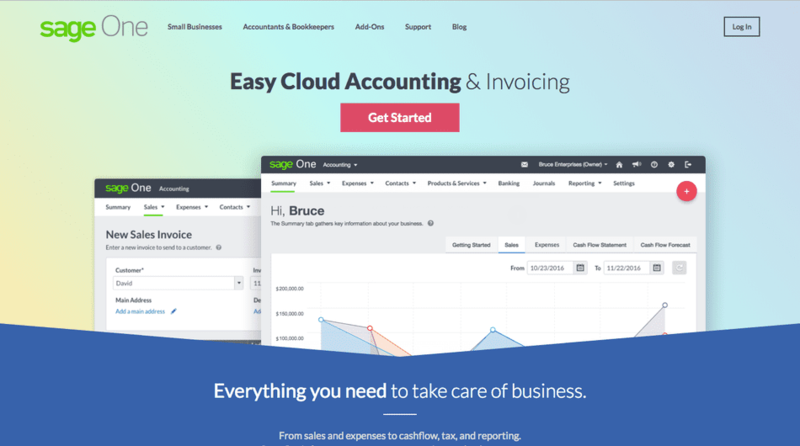 If you need flexibility, this is ​the accounting software for you. For instance, AccountEdge’s Inventory command center allows for inventory control that includes multiple pricing levels, kit-building, and negative inventory. When time billing, you can use multiple billing rates and easily track chargeable and non-chargeable time. It also offers over 200 customizable financial reports and has the ability to sync with Shopify, a hosted web store application that lets you sell online. Visit the AccountEdge website for more information.